In the last few years weâ€™ve had zombies in Cuba and Africa, zombie found-footage pics, genuinely funny zombie comedies, hell, even â€œThe Walking Deadâ€â€™s most recent season was its best so far. If you think about it, the zombie subgenre is the perfect platform for experimentation, and cheap or expensive, dead serious or super-cheesy, heady or just an excuse for excessive gore, there are still new stories to tell. Billed as â€œDawn of the Deadâ€ meets â€œMad Maxâ€, the new Australian film â€œWyrmwoodâ€ earns its brain supper by simply being a ton of fun. After a mysterious meteor shower turns select members of the populace into the undead, brother and sister Barry (Jay Gallagher) and Brooke (Bianca Bradey) are separated by miles of Australian countryside full of zombie screechers (seriously, thereâ€™s some major screeching going on). Barry finds himself stuck in a garage with two other survivors Benny (Leon Burchill) and Frank (Keith Agius), while Brooke has been captured by a chipper and amoral Doctor (Berryn Schwerdt) searching for an antidote to the undead plague. Backed up by a band of rogue soldiers, the Doctor subjects Brooke to a series of tests that give her the ability to link telepathically to the Doctorâ€™s zombie collection. Meanwhile, Barry and his pals discover that the meteor shower has affected all fuel so that it no longer burns, meaning the truck they have is useless unless they can find an alternate fuel source. As it turns out, zombie breath will do the trick nicely. So they strap a handful of shamblers into a cage, modify the engine, and set out in search of Brooke. 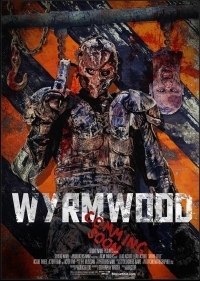 Unlike the Spierig Brothersâ€™ â€œUndeadâ€ (which I felt flew off the rails early and never recovered), â€œWyrmwoodâ€ is a fairly simple beast inspired as much by â€œEvil Dead 2â€ as anything else, and it does a great job of channeling that filmâ€™s fusion of black comedy and over-the-top bloodletting. The opening scenes play as more straightforward horror, up until the Doctor shows up and dances to the Bee Gees, and from that point on director Kiah Roache-Turner keeps things rowdy and crazy fast-paced as Barry and his crew suit up in riot gear and football pads and take the fight to the biters. It barely matters that the movieâ€™s two hooks, the â€œzombie gasolineâ€ trick and Brookeâ€™s mental superpowers, are fairly silly, since they introduce some welcomely fresh ideas and provide plenty of opportunities for road carnage and general mayhem. And real credit should go to the cast for taking the material seriously in just the right amounts. With the exception of comic relief Burchill, whose Benny is borderline-annoying, the cast never lets on that they know theyâ€™re in a horror-comedy. Gallagher is particularly good, as is Luke McKenzie in a brief role as The Captain; the two of them have a fight scene near filmâ€™s end that is both well-performed and surprisingly effective, and it had me wishing McKenzie had gotten more screen time overall. So once again, reports of the zombie movieâ€™s demise are greatly exaggerated. â€œWyrmwoodâ€ is a solid reminder that sometimes we just want to watch bullets fly and blood splatter, and thereâ€™s no shame in having a good time with the apocalypse. As a side note: be sure and track down the short, also called simply â€œWyrmwoodâ€, that Roache-Turner made as a proof-of-concept for the feature. Itâ€™s a tight, 10-minute primer that features Gallagher and Yure Covich in slightly different roles than they play in the feature-length version, and is well worth the watch. Great first half hour, almost restored my faith in the zombie genre.. then it went awry.